This 30-day DVD series will be your tool to self discovery and a deeper understanding of God’s love for you. We live in a fast-paced world with high expectations, resulting in a chaotic life. We will explore the Seven Deadly Sins in contrast to the freedom we gain from the Fruit of the Spirit. Learn to love yourself and the people around you by conquering CHAOS with Love. The 30-day program includes a DVD segmented into weekly video presentations, a comprehensive teaching section and getting personal questions for you to answer in the provided workbook. In an effort to keep you engaged, each day includes a scripture, a thought and a question. Also comes with a pocket-sized daily reader. 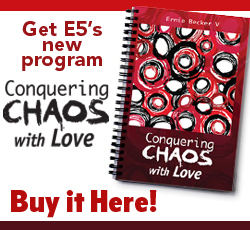 Another way to experience Conquering Chaos with Love is with our online version. It includes all the same teachings and questions as the hard-copy in an easy-to-read format as well as portions that are PDF downloadable. Once you purchase the program, you will have 60 days to complete it. After 60 days, the material will not be accessible. The goal is that you engage daily, where you will receive automatic daily emails, however weâ€™ve made allowances for lifeâ€™s little hiccups, if you will. You can take a short break between weeks and donâ€™t fret if you miss a day or two; you can pick up where you left off. Just be mindful of the 60 day window. 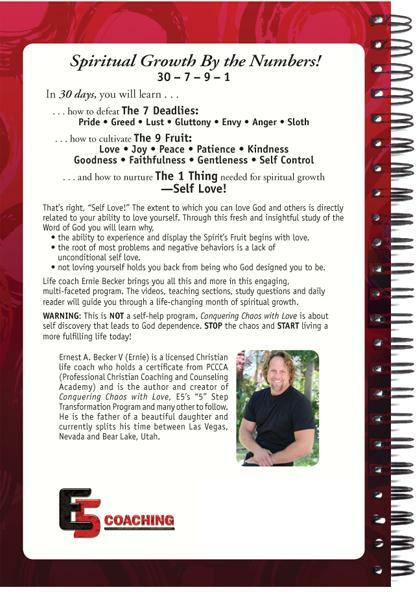 Conquering Chaos with Love program provided by your small group leader. This is not a stand alone product.